While I was on my USA Swing last August and September, the door of my fridge broke off. The top hinge, which is a plastic tube molded into the door, cracked off. My good friend Kevin did a temporary repair while I was staying with him and Shelly in Memphis. Eventually, that broke off too. Getting things repaired on RVs is not an easy task. 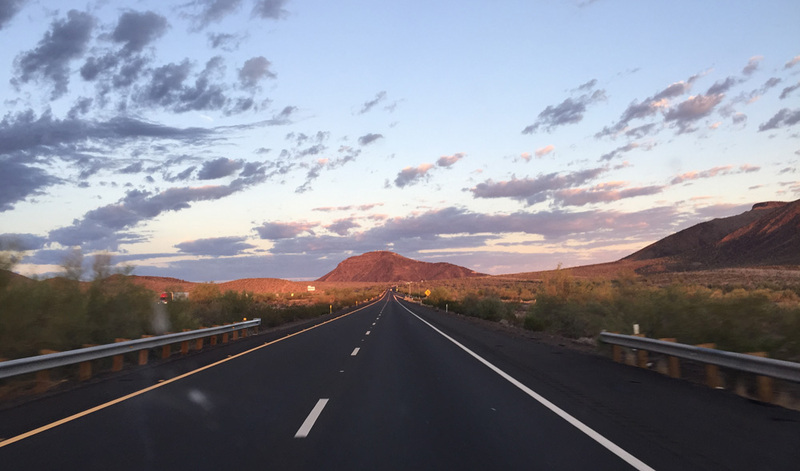 The nearest RV Repair shops to Marin are in Petaluma, Napa, and Sacramento—all at least 45 minutes away and all have at least 2-week back-ups. My dealer in Sacramento has a 3-month backup waiting period. And, it turned out, the repair places in Petaluma won’t service Dometic products. “They don’t pay us back,” one said. But I did find Dan Shavlick’s RV Repair in Napa (45 minutes with no traffic). His wife/office assistant Jodi made me an appointment for 2 weeks later. I needed to be there at 8:30 am since there is a line-up waiting at the door when it opens. I took this little video of the winter wine country scenery on my way. It is unusual to see snow on the hills surrounding the Sonoma and Napa County valleys. 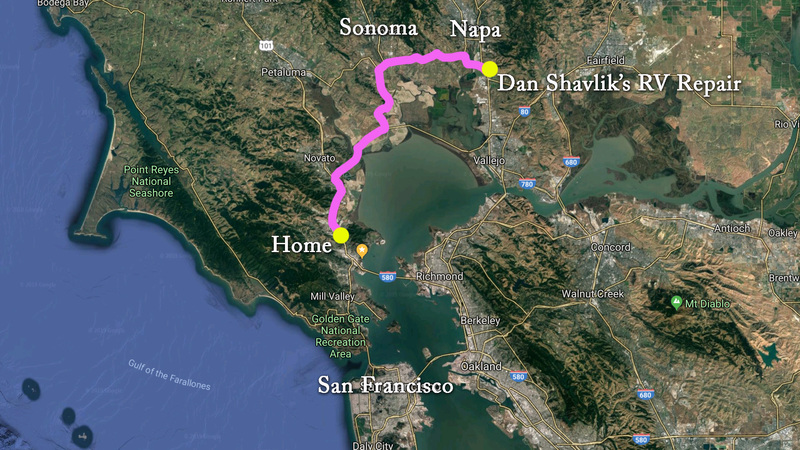 My route from Marin County to Napa Valley. Dan took photos of my broken hinge and will get back to me when Dometic sends him a new door. Fingers crossed that will be within the next month. Meanwhile, I am using a small Igloo Playmate Ice Box. I hope everyone enjoyed the holiday season. I spent Christmas with my son and his family in the Bay Area, then headed south to Pasadena for a few days to open more presents with my daughter, her husband, and their two energetic sons. From there I drove to the California desert to explore a part of my state that was too hot to be in when I drove through last September. Here is the link to my YouTube video. If you don’t feel like watching a video, here are the pretty pictures. The first two are of North Shore on the Salton Sea. I wish you could hear the seagulls. I think this next one is of Slab City. I didn’t realize I missed that eccentric town until it was too late to backtrack. 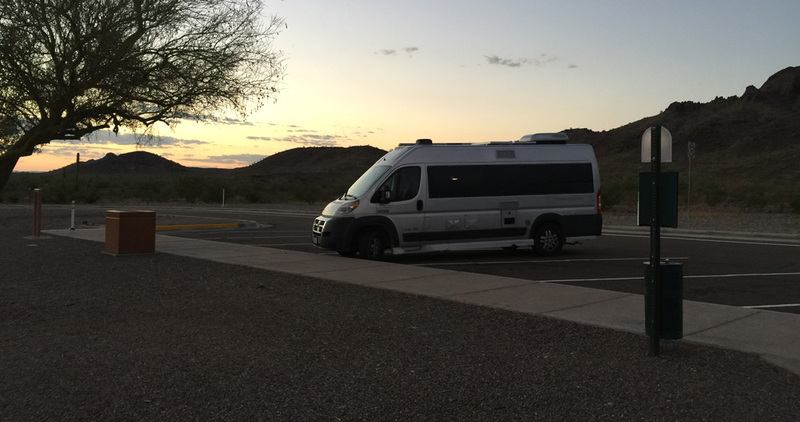 I spent the night boondocking at a BLM (Bureau of Land Management, i.e. free) camping area called American Mine Road. Then drove around Yuma, Arizona the next morning. I also bought gas there. Gas in Arizona is a dollar cheaper per gallon than in California. From Yuma, I cruised through sand dunes swarming with zooming dune buggies. It looked like fun. Then through the Anza-Borrego Desert. And through Julian, elevation 4000 feet (so check out the snow). There was no place to park, so I couldn’t pull in and walk around as I had planned. I spent the night at the Vail Lake RV Resort in Temecula. Very nice. Here is the view from my van the next morning. A lovely, peaceful place to enjoy a cup of coffee. Annie liked it too. Hi. I hope everyone had a fun Thanksgiving. Lucky me, I got to be with all three of my grandsons and their families. Meanwhile, I was able to finish this video compilation of my trip in September 2018 through southern Massachusetts following the Henry Knox Trail (West Springfield to Cambridge). I also visited some amazing libraries. I sorta screwed up on my video labeling. This is Part 2 of following the trail but actually, Part 4 of my series on being in New England doing Henry Knox related things. For a copy of my sing-along children’s history book about the trail, Henry’s Big Kaboom, go to the Fort Ticonderoga Museum Store at http://www.fortticonderoga.org and click the ‘shop’ tab. You can also order it on Amazon. You can view the animated video (same title – Henry’s Big Kaboom) on YouTube. To view my video about following the first part of the Henry Knox Trail go to https://youtu.be/aD9fu4BeTzI. For a written guide (pdf) to following the Henry Knox Trail, check out the Hudson River Valley Foundation website at http://www.hudsonrivervalley.org/themes/knoxtrail.html. They updated the guide a year ago. That’s it for now. Keep on Rambling. 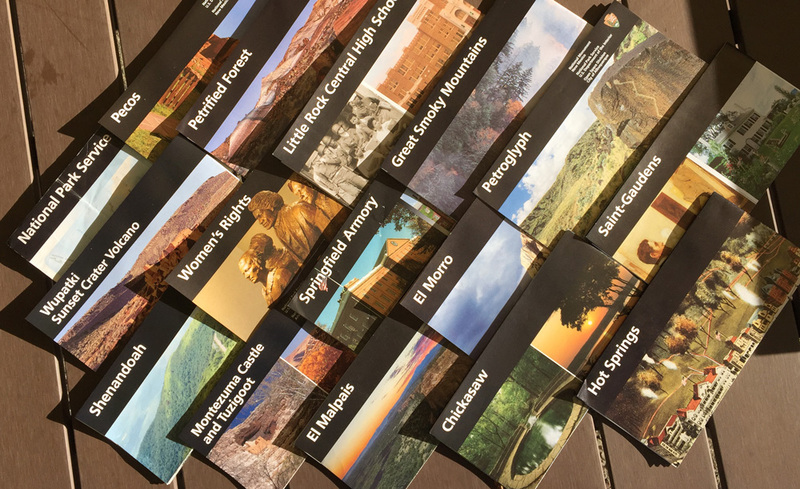 Traveling westward, I visited 5 National Parks, 3 National Historic Sites, 5 National Monuments, 1 National Recreation Site and 1 National Historical Park as well as county and state parks. I’ve just posted on to YouTube my video’s of my August to September USA Swing. In the second video, I included a clip about how I found free or inexpensive campsites using an app called AllStays. Here are the links. The video for the trip eastward takes about 12 minutes and the video for the trip home is 33 minutes. I love it when people leave comments on YouTube and subscribe to my channel. I feel so lucky to have been able to see our spectacular county this way. Next time I take this trip, I will make it in October and November when it is cooler. Green dots indicate destinations that are part of the National Parks system. Red dots indicate cities I visited for family reasons. The cheapest gas was in Texas at 2.39/gallon. The number of animals I saw as roadkill: 3 beaver, 1 snake, 1 deer, and 6 armadillos —I got the impression that armadillos move slowly — plus countless opossums, raccoons, and squirrels. I saw only 1 bear. He/she was alive. 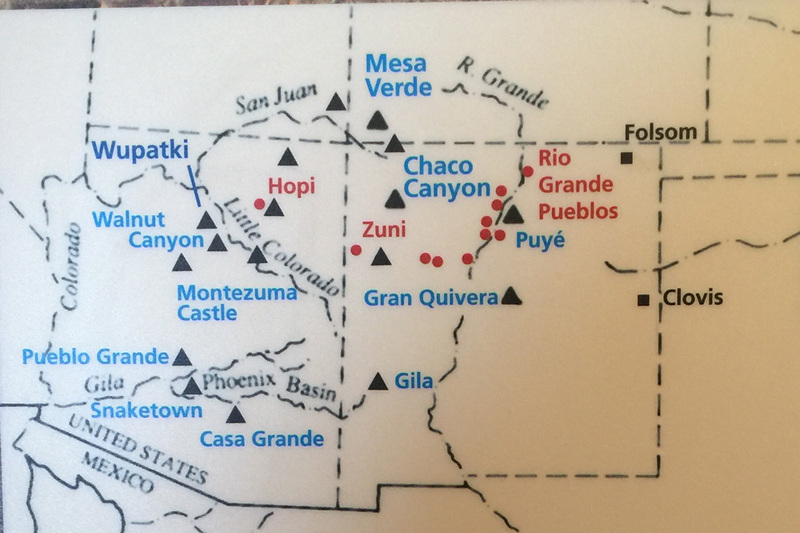 My last set of tours included the ancient American native sites in Arizona. There are a lot of them. 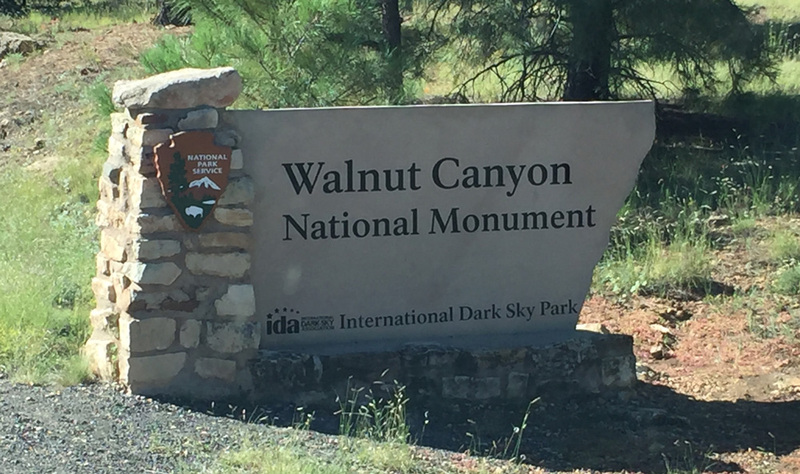 I only saw the National Monuments of Wupatki, Walnut Canyon, and Montezuma’s Castle. 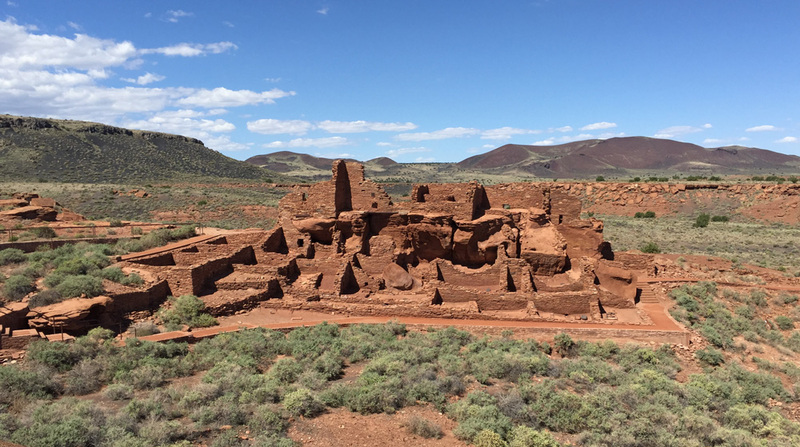 The Wupatki lived north of today’s Flagstaff, elevation 7000 feet, surrounded by volcanos. Here is a rendering of what archaeologists think the place looked like 900 years ago. 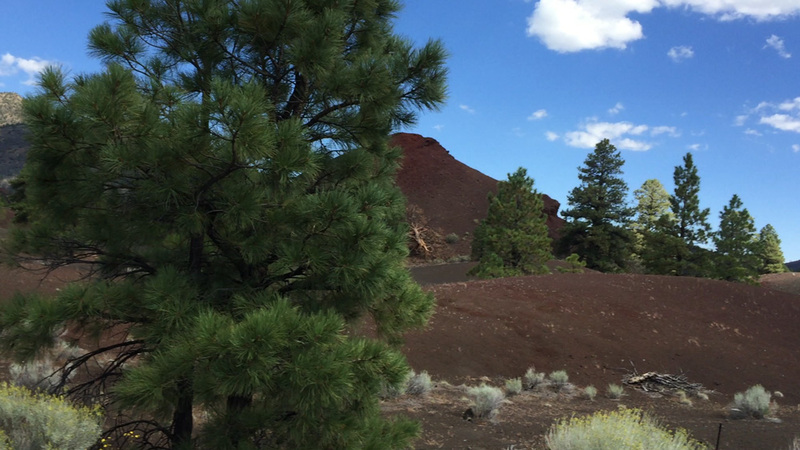 Their civilization was nearly wiped out when the Sunset Crater volcano erupted. The volcano is its own national monument (i.e. another stamp on my National Parks Passport). The photo above is of some of the hills still covered in cinders. 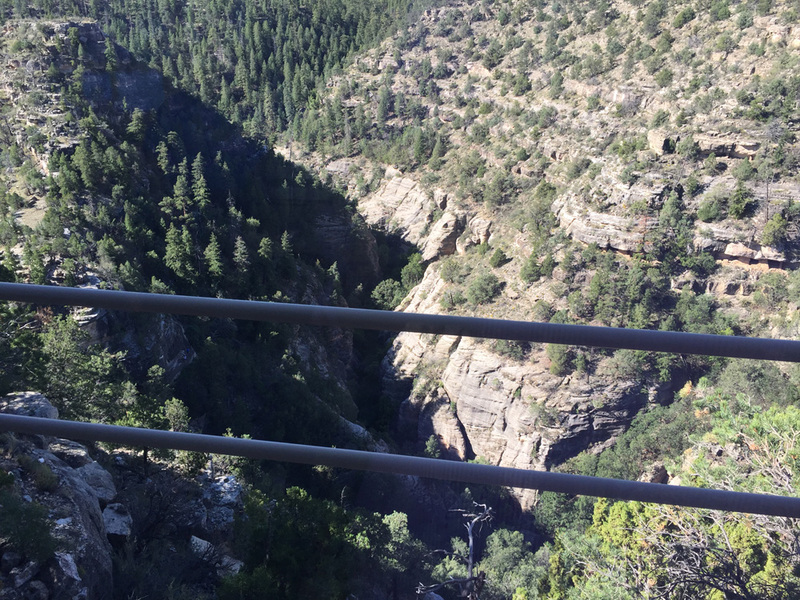 Within the city limits of Flagstaff, I arrived at a narrow, deep gorge called Walnut Canyon, where from as far back as a thousand years ago people lived in caves. 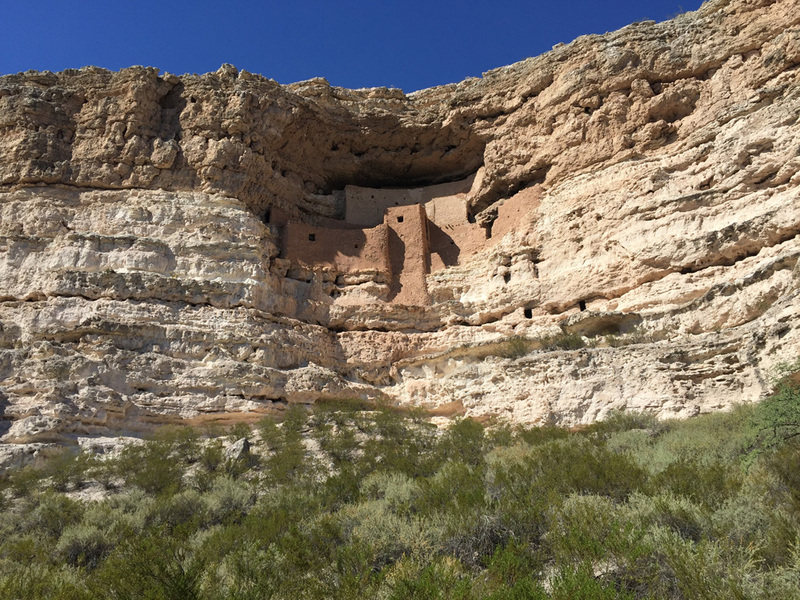 My final stop was Montezuma’s Castle. I remember seeing it when my parents took my two brothers and me on a road trip to Santa Fe in 1964. My family was allowed to walk around the ancient ruins, which have since been closed off to the public because they were being worn away. The park built a model of a cross section showing what the castle might have looked like. Annie was allowed on the quarter-mile path to see the castle. Fortunately, the path was shaded with sequoia trees. It was 100 degrees out and I had more desert to drive through to get back to Pasadena. When my family drove to Santa Fe back in 1964, we followed Route 66. There are many remains of the old route along today’s Interstate 40. I wanted to spend my last night in Quartzsite, Arizona, which I had heard about. But I couldn’t reach it before dark. Instead, I watched my last desert sunrise from a Rest Stop. My final drive through the desert the next morning was lovely. The entomologists at the Smithsonian would envy Ramsey’s bug collection. 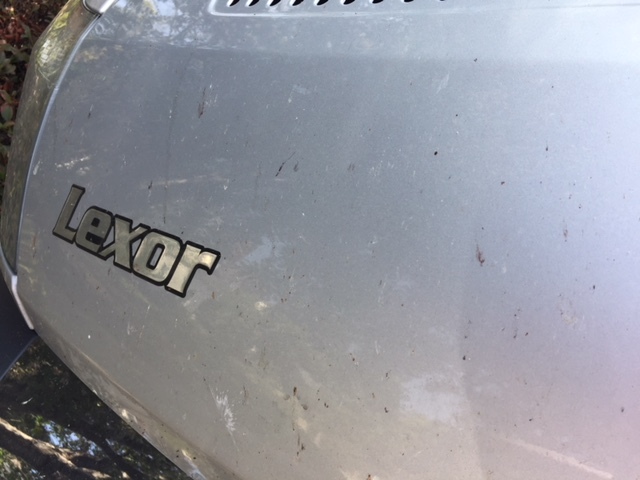 There are bug splats from 28 states. Now I get the challenge of washing them off. Back to having fun. Near Santa Fe, New Mexico, I came to Pecos National Historic Site, where stands the foundations of a pueblo and a Spanish church built in 1690. 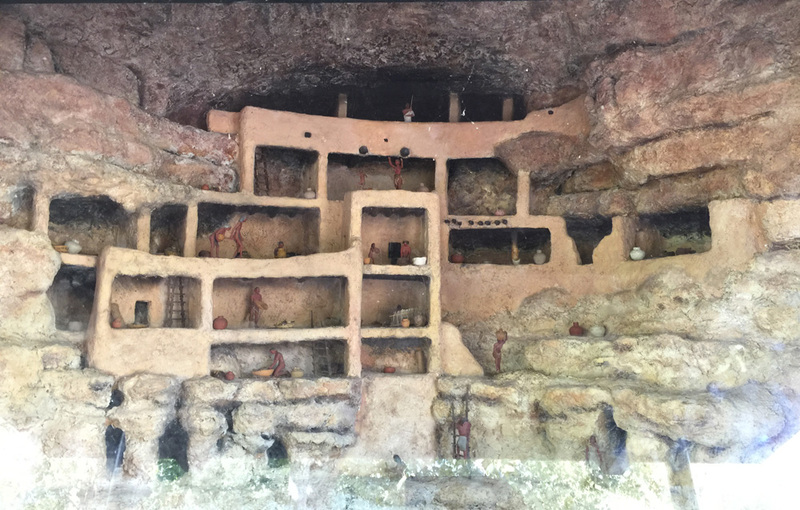 Underneath those structures, and in surrounding excavations, archaeologists have unearthed evidence of people living in this key geographic area for over 9000 years — hence the site’s preservation by the National Parks and why Santa Fe grew up near by. With my brain packed with the area’s history, I drove on to the charming Santa Fe itself. I’ve been there before, but it’s amazing how different the experience is driving to a place knowing its historical and geographical significance versus arriving by train or plane. I walked around the plaza looking for a coffee shop (my jewelry box is already stuffed with silver jewelry, so shopping was of no interest) and settled for a cookies and cream ice cream cone. Annie was allowed in the shop. She’s great at meeting people for me. While slurping, I chatted with the couple sitting next to me. They were also from the San Francisco Bay Area. There was still enough time to head south again to Albuquerque to see the Petroglyph National Monument. The Visitor Center is in the center of the park, but not within walking distance of the petroglyphs. Since it was still too hot to leave Annie in the car, I decided to check into the nearby High Desert RV Park and tour the old Route 66. I would return to the trails when it cooled. Then some dark clouds arrived and suddenly it was pouring rain out. I realized I loved my dog more than I loved petroglyphs. I will return to see the petroglyphs when I’m dogless. Next was a second badlands National Park known by the Spanish word El Malpais. The park is basically a huge sea of lava (3.5 million years old) surrounded by sandstone cliffs (150 million years old). I drove down one side then the other, which took about two hours. Then I backtracked ten miles to see the Indian Pueblo called Sky City. As its name implies, it sits on top of a bluff. The drive up to the pueblo was worth the trip, but the museum was worthless. To see the actual pueblo, I needed to pay a large fee and leave Annie in a strange kennel for a couple hours. I contented myself with viewing the pueblo via a YouTube video. Thank goodness the site is being preserved for history sake. The Sky City Casino helps pay the renovation bills. What counts is what was. I reached El Morro National Monument. I loved this place. The rock “headland” creates a gate on the south side of the centuries-old east-west trail. It also serves as a landmark for a water pool that collects at the base of the cliff. The pool has been the drinking fountain for travelers since forever. It is 150 miles from any other water source. 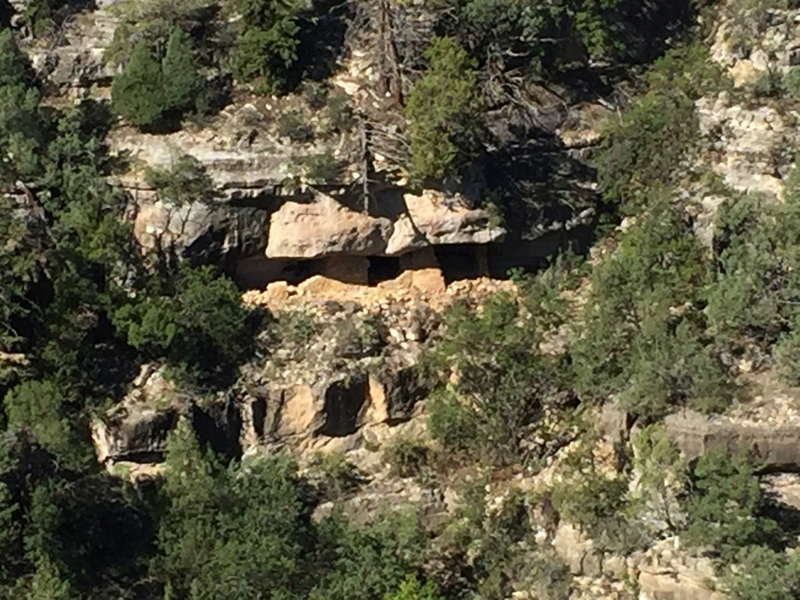 Indians left petroglyphs on the wall of the cliff by the pool. The Spanish explorers signed their names with the message, “passed by here.” So did the pioneers. Dates range from 1607 through the 1800s. 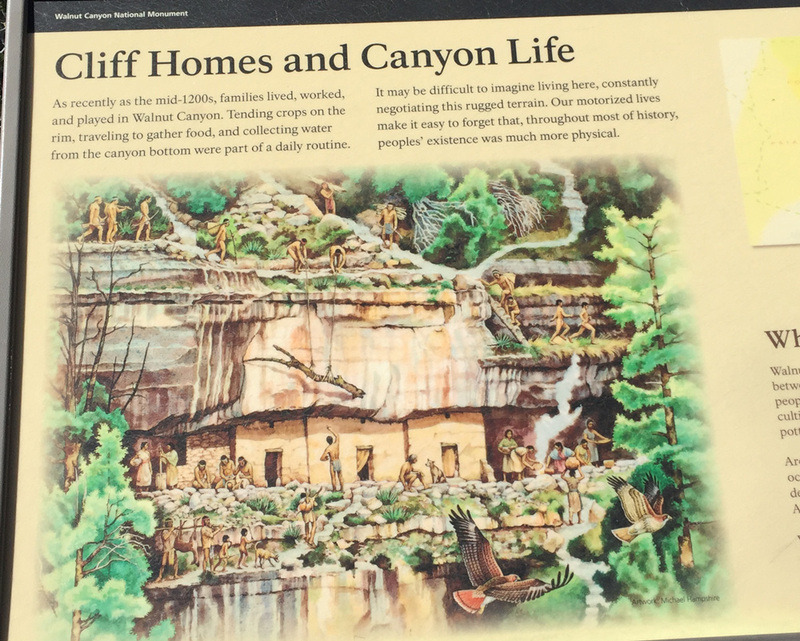 The National Park ranger gave me a guide that explained the history behind each inscription. For example, two pioneer sisters who signed their names continued on through the Mohave, survived a bloody Indian raid, and ended up settling in Fresno, California. One of the Spanish explorers, General Don Diego de Vargas “was here” in 1692. You’ve got to see this place for yourself. Moving on, I ate lunch in the Zuni Village. Roasted corn. Yum. 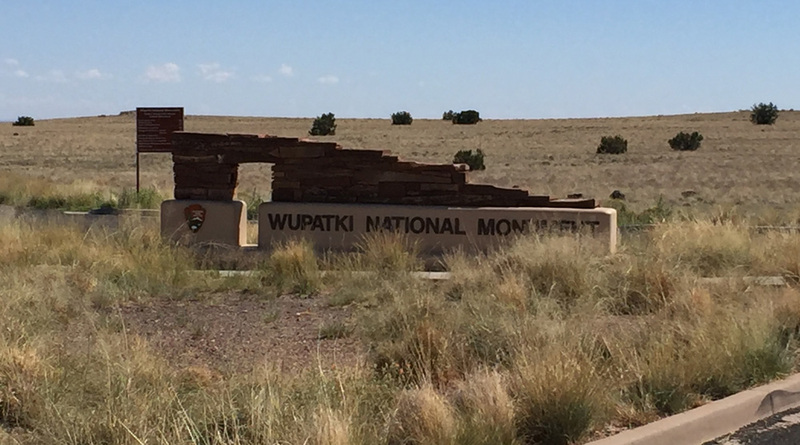 Crossing into Arizona, I spent the afternoon driving the 28 miles north to south through Petrified National Forest. Then the petrified logs. My photos don’t do justice to any of this. The colors and the expansive vistas must be experienced in person. 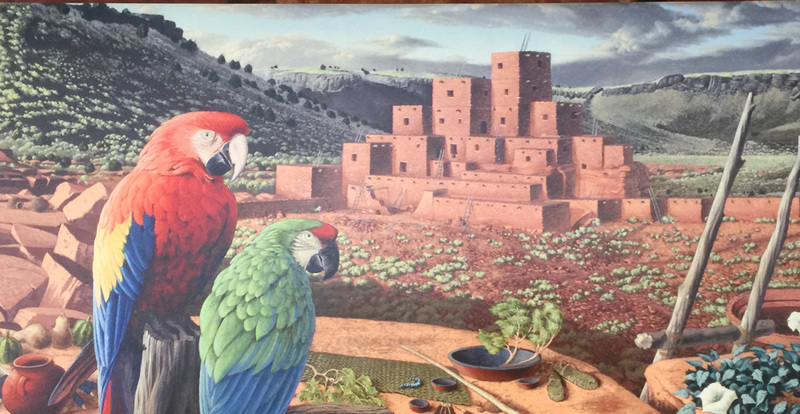 I’m going to visit more ancient pueblos tomorrow. 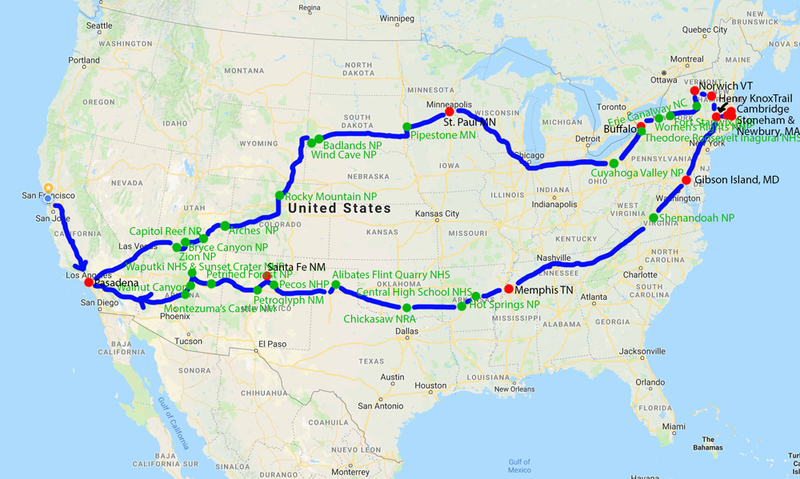 I’ve been on the road for 40 days. I’m ready to head home. Today we have a tie for The Charming Old Library Award. Check out Brookfield’s Merrick Library and its neighbor, Spencer’s Richard Sugden Library, both built in the late 1800s when it was cool to be a philanthropist. The librarians were excited to get a copy of Henry and well aware of the history. Merrick Library from upstairs looking down. Merrick Library at the south end of Brookfield Common. Richard Sugden Library in Spencer. Brenda Mettterville, who has been the librarian at Merrick for over 20 yrs, showed me some old photos of the celebration in 1927 in Brookfield for the placement of the Henry Knox Trail monuments as part of the 150th anniversary of the Revolution. Monument No. 13 for the trail is at the other end of Brookfield’s Common. It overlooks Route 9, once the Boston Post Road, that connects all the towns I visited today. In fact, if you are only looking for monuments (and not libraries, too), all you need to do is stay on that road. Monument No.14 is right around the corner from Spencer’s Richard Sugden Library. It also looks out over Route 9, like a little soldier. The next town is Leicester. Monument No.15 is right out in front of the Leicester Public Library. The library is closed for construction so I will send them their book when I get home. Meanwhile, the monument is neglected and surrounded by weeds. Next was Worcester, a big city. By noon, it was 94 degrees out. It was hard to find cool places to park the van so I could leave Annie in it long enough to run into the libraries and take photos of stones. Monument No. 16 is part of the front walkway of the courthouse and gets the Hardest To Find Award for today. Main Street splits in that area with a tunnel in between the split. One-way streets make the area even harder to navigate. The modern Worcester Public Library is relatively easy to find. It is gigantic and so is the parking lot. I worried about how hot the van would get by the time I walked the length of the lot to the library, paid for parking, and found Cynthia Bermudez, the Coordinator of Youth Services, whom I’d been communicating with. When I learned she was busy, I let the assistant librarian have the book, told her that the information and links to the videos were on the HenrysBigKaboom.com website and fled to get back to Annie. From there (2:30pm) I drove to Whole Foods Market in Shrewsbury to buy a healthy salad for lunch. Shrewsbury is the next town over from Worcester and home of Monument No.17, which stands across the street from the Shrewsbury Public Library. I pulled down all the shades in the van and turned the fan on high. Then I dashed to the monument, took my photos, dashed across to the library, easily found the Youth Services Director, Sonia, nearly threw the book at her and made it back to the van before it got too hot. Actually, I had a nice, though quick, chat with Sonia. Pooped and sweaty, I headed to the nearest camping place, Sutton Falls, about a 30-minute drive. The trip through the countryside was calming after my tangle with the city of Worcester. As you can see from the pix, the campground is nice and friendly. Annie and I are still trying to chill. Tomorrow, starting at 9:30am, I bring out the ukulele for the children of Northborough. Tomorrow is borough day. I also visit Marlborough, and Southborough as well as Framingham and Wayland. Wayland has two monuments. As I’ve mentioned, I visited the monuments in New York, and the first 7 monuments in Massachusetts last June. Here is the map for this trip. Massachusett Monuments for the Henry Knox Trail from West Springfield to Cambridge.